I look forward to reports on your project. I'm an old schooler-ground skimming is the never fly higher than you care to fall school of recreational fun. Ground slamming is the comix parody ( and what was actually happening until you "got it")- there was even a Ground Slammer mag parody. Oh the good old days! I haven't seen a sweaty pilot in just cut off's coated is sand like a piece of breaded chicken in too long. I remember my last ground slamming session-a old Flex i-Flyer I literally dug up out of the sands at Torry Pines-I equipped it with a poly tarp sail and set an unofficial word record with it. I was at the bottom of the bunny hill doing my first practice run, got sucked off the ground by a passing thermal and carried off. The thing was so out of trim it had two speeds, minimum sink and stall. The film of my climb out angle is awesome- I struggled to get out of the lift and dump it into some bushes. Some one recently asked " what is the lowest height you hooked a thermal from?" Some body is going to have to hook a thermal from a hole in the ground to beat me! Post this if you like. Aw....memories. I learned to fly in my Skysail (see profile image). I've said many times it would be like learning to drive in a hot Italian racing sports car. I can still remember a milestone in my learning to hang glide - it was a Sunday evening, driving home from a training hill. I suddenly realized that I had been out flying my wing and I didn't hurt anywhere! No bleeding cuts, no bruises, no sprains, a true milestone. 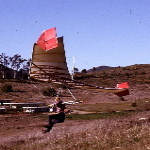 My Skysail hit the ground hard so many times that by the time I could actually fly, it was almost not airworthy anymore. It finally met its end in the flaming San Diego Aerospace Museum. Been there, done that - welcome Ground Slammer. BTW - If you want to see sweaty pilots in shorts and covered with sand, join us at Dockweiler Beach for an afternoon of hang gliding like it used to be (but with much better flying hang gliders). I really enjoy flying at Torrey, but when we fly at Dockweiler, we're right on the beach ... not 300 feet above it. It's great for interacting with the public on every flight. But both are great sites. We're very lucky here in southern California. 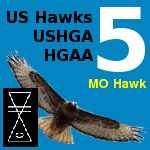 Welcome to the US Hawks!! Chuck Slusarczyk radiated to his mentees "the right stuff" ... honorable ways and means. Looking forward to your explorations. Here you go Ground Slammer - life at the beach. My 2nd flight beginning for my new Condor 330. Bob & Joe already had several by this time.